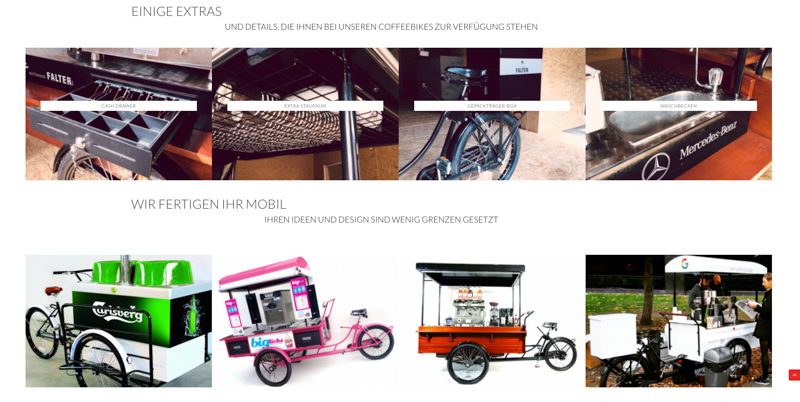 Coffee Latino is a mobile food and drink company that builds custom coffee bikes, vans, dessert carts, Piaggio’s, food trucks and even Segways for solo entrepreneurs, large corporations and everything in between. There’s a good chance you’ve seen one of their creations at a major event of some sort. Established in the UK 16 years ago with a customer base reaching world-wide, Coffee Latino has become the industry leader in the mobile coffee van business with no signs of slowing their pace. Call it fate, but the company’s expansion into Germany as Coffee Latino Deutschland is based locally in Kaiserslautern where Patrick Thompson (the owner), and I connected through a mutual associate. The client had a basic design started in WordPress that he was less than happy with. He wanted a clean, modern design that presented all of the information in a professional way but admitted that web design, making edits in Photoshop, and all the technical aspects involved in actually making a website work aren’t his forte. Entrepreneurship and building beautiful things from raw materials by hand are, and he’s really great at both. With a stream of orders to fulfill (each coffee bike or vehicle takes anywhere from 1-3 weeks to build), he didn’t have an abundance of free time to figure it out. Primarily–as is the case with many business owners–he needed to focus on running the business. Struggling to build a website was not the most effective use of his time. After a few rounds of brainstorming, revising, and trying to make the original design fit the vision using Divi we agreed to scrap the entire thing and start fresh. In this situation, The7 proved to be an ideal starting point for the desired look and functionality. Incorporating aspects from a number of layouts, we were finally able to create a site that represents Coffee Latino Deutschland in the best way and better communicates the value of their business. “In the best way” included an unexpected but necessary migration from Hostgator to Siteground. Multipurpose themes aren’t lightweight by any means, but even after mitigating some of that by disabling unnecessary features, compressing and combining the code, etc., the slow performance on Hostgator was unacceptable. After hosting a number of sites with Siteground (disclaimer: this is a referral link), I knew it would be the best move with regard to value, performance and ease of use. The migration process went smoothly, and Coffee Latino Deutschland is very pleased with the switch. Be sure to visit Coffee Latino Deutschland at their new website and leave some feedback here if you like. You can also follow them on the socials at Instagram and Facebook!